Two passenger trains collided head-on in Taebaek, Gangwon Province Tuesday, killing one person and injuring 92 others. As of Tuesday night in Korea, police were still investigating the exact cause of the crash between the tourist and commuter trains, although it was suspected that one of them missed a traffic signal. 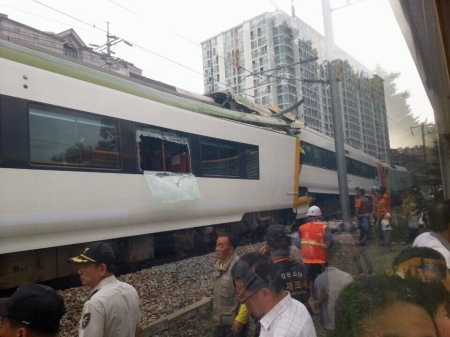 The accident occurred at 5:53 p.m. between Taebaek and Mungok stations. The dead passenger was confirmed to be a 77-year-old woman who was identified only as Park. The injured were being treated at three hospitals in Taebaek with 10 of them reported to be in critical condition, the authorities said. “It appears that the tourist train did not stop despite a stop sign near Mungok Station and collided with the Mugunghwa commuter train that was waiting outside the station,” a Korea Railroad official told Yonhap News. Forty-three people were on the tourist train and 67 on the commuter train. 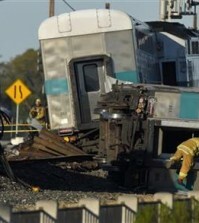 Both of the trains derailed due to the collision. Several passengers told reporters they jumped off the trains after hearing a huge bang and feeling a thundering shock. Rescue workers were on the scene immediately and evacuated dozens of other passengers. Mungok Station is on a single-track railway and the tourist train was supposed to have temporarily stopped to let the other train leave. The Ministry of Land, Infrastructure and Transport said Minister Suh Seoung-hwan plans to be at the scene of the accident soon where he will be joined by a team of railroad safety inspectors. An official with the ministry said further investigation would be needed to determine who was at fault in the collision.